...breathes new life into the zombie genre as it unfolds a post-apocalyptic saga that follows a group of survivors, led by police officer Rick Grimes (Andrew Lincoln, Love Actually), who searches for a safe haven and, hopefully, a new home, far from the undead that now roam the earth hungry for human flesh. Each episode explores the challenges of life in a world overrun by zombies, and the toll it takes on the survivors who now find themselves going to extremes just to see another day. Beverly Hills, CA – Take a walk on the undead side, as the groundbreaking, genre-bending AMC® original series The Walking Dead: The Complete First Season rises again when Anchor Bay Entertainment releases the Blu-ray and DVD of the hit show that wowed both critics and audiences. The SRP for the March 8 release is $49.99 for the Blu-ray, and $39.98 for the DVD. Pre-book is February 9th. Both the The Walking Dead: The Complete First Season Blu-ray and DVD contain all 6 episodes of the first season on a 2-disc set and are packed with special behind-the-scenes featurettes and insightful extra footage. Nominated for a Golden Globe® for Best Television Series - Drama, The Walking Dead: The Complete First Season breathes new life into the zombie genre as it unfolds a post-apocalyptic saga that follows a group of survivors, led by police officer Rick Grimes (Andrew Lincoln, Love Actually), who searches for a safe haven and, hopefully, a new home, far from the undead that now roam the earth hungry for human flesh. Each episode explores the challenges of life in a world overrun by zombies, and the toll it takes on the survivors who now find themselves going to extremes just to see another day. In this horrific world gone mad, each turn brings new surprises and dangers, as the survivors try to regain some semblance of a normal life. 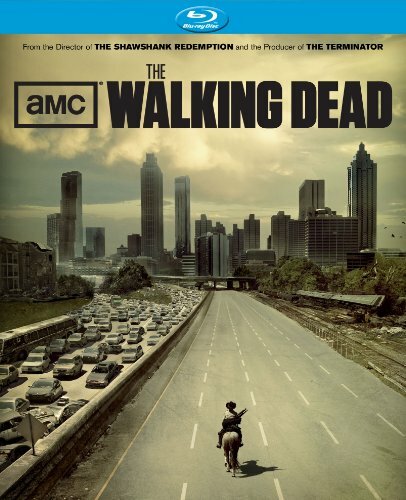 The Walking Dead is based on the popular Image Comics' comic book written by Robert Kirkman. The series premiered on AMC Fearfest Halloween night and immediately became the most watched drama series in cable's history among Adults 18-49 with 3.5 million viewers. It also gained a following among critics (from People to Vanity Fair) who have hailed it as one of the best new series of the year. Anchor Bay Entertainment is the home entertainment division of Starz Media, LLC. It includes the Anchor Bay Films and Manga Entertainment brands. It distributes feature films, children's entertainment, fitness, TV series, documentaries, anime and other filmed entertainment on DVD and Blu-ray formats. It is the exclusive distributor in the U.S. of the theatrical titles from Overture Films. Headquartered in Beverly Hills, CA, Anchor Bay Entertainment has offices in Troy, MI, as well as Canada, the United Kingdom and Australia. Starz Media (www.starzmedia.com) is a controlled subsidiary of Liberty Media Corporation attributed to the Liberty Capital Group. AMC reigns as the only cable network in history to ever win the Emmy® Award for Outstanding Drama Series three years in a row, as well as the Golden Globe® Award for Best Television Series - Drama for three consecutive years. Whether commemorating favorite films from every genre and decade or creating acclaimed original programming, the AMC experience is an uncompromising celebration of great stories. AMC's original stories include Mad Men, Breaking Bad, The Walking Dead and The Killing. AMC further demonstrates its commitment to the art of storytelling with curated movie franchises like AMC Hollywood Icon and AMC Complete Collection. Available in more than 96 million homes (Source: Nielsen Media Research), AMC is owned and operated by Rainbow Media Holdings LLC, and its sister networks include IFC, Sundance Channel, WE tv and Wedding Central. AMC is available across all platforms, including on-air, online, on demand and mobile. AMC: Story Matters HereSM.